For me, eating is not quite the same as dining. There are loads of places to eat, ranging from franchise burger joints to cutting-edge gourmet palaces. When I dine, however, I look for the convergence of three essential factors: cuisine, service and ambiance. Like a tripod or a three-legged stool, the restaurant experience topples without great food, professional service and appealing ambiance, all working in tandem. The three, together, create culinary synergy that is bigger than the sum of its parts. These 25 one-off restaurants are all can't-miss destinations for dependable dining. At Bambara, in the Hotel Monaco, chef Nathan Powers combines classics like his superb steak frites with unique dishes such as Maple Leaf Farms Duck grilled breast and leg confit with liver butter, watercress, sweet-potato oven wedges and pomegranate syrup. Top-notch service rounds out the dining experience. A recent relocation has breathed new life into this friendly, intimate dining spot. Go big with seafood paella or small with an assortment of hot and cold tapas. You might not be in Spain, but it sure feels like it. The Italy-inspired Sunday brunch here is terrific, but you can enjoy the flavors of Italy at Caffé Molise any time. Pastas like orecchiette al salsiccia compete with entrees such as involtini di pollo as crowd favorites. Grab a seat in the courtyard in warm weather for al fresco dining. True to its name, the centerpiece of this very appealing restaurant is a long communal table, where you might find yourself supping next to total strangers. Perfectly cooked pan-roasted salmon is fantastic—almost ethereal—and nearly every dish incorporates locally produced, artisan food products. This is one of the city's most popular spots for a quick nosh at the counter overlooking the kitchen or at a table in the dining room with a multicourse meal. 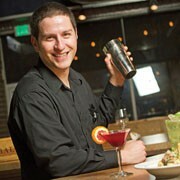 Chef/owner Ryan Lowder's cooking is always spot-on. This is my favorite SLC restaurant, in fact. A must-have at this Italian gem is the pollo della casa—a souped-up version of classic chicken piccata; oh, and the airy pillows of fresh-made gnocchi, too. But the main attraction is owner/bon vivant Valter Nassi, the warmest and most welcoming restaurateur in town. Included in Food & Wine magazine's Best Chefs of 2011 issue, owners/chefs Viet Pham and Bowman Brown dish up cutting-edge fare that is consistently innovative, thrilling, artful and delicious. Sous vide cooking is frequently employed, and offerings such as wild-ono confit and anise-scented elk tenderloin excite even the most hardened foodies. Tucked away in a small house, this is a hidden Holladay gem. French-born chef Franck Peissel may have a classic culinary background, but he's warmed quickly to contemporary American flavors. To wit: his slow-braised pulled pork, veal and chicken meatloaf with lingonberry sauce is a must-have. If there is a more inviting, cozy spot to dine in town than Fresco, I haven't found it. Fresco is the perfect spot for a romantic interlude or just a friendly meal with friends, especially in the courtyard during warm weather. The nightly risotto is irresistible, and you'll also love hearty pasta preparations of carbonara, Bolognese or the lighter Dungeness-crab gnocchi. Grand America Hotel ambassador Ali Raafati, Garden Café executive chef Phillip Yates and chef de cuisine Phelix Gardner team up to create a combination of cuisine and service that is impeccable. 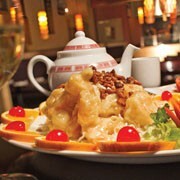 Add to that the Grand America's eye-popping décor, and you've got a perfect recipe for fine dining. This inviting, family-owned restaurant is a bright, shining light in downtown Salt Lake City, serving up a delicious array of flawless Chinese and Thai cuisine, all in a beautifully conceived setting. It's one of the most visually appealing restaurants in the city. Honey-glazed walnut shrimp is a must. This is a local treasure: a rustic log mansion situated in a national forest just four miles from SLC—a lovely place to enjoy chef Dave Jones' culinary creations. Alpine nachos are a crowd-pleaser, and folks watching their diet enjoy the nightly "low-cal/high-impact" special. Plus, there's live piano music nightly. There are those who consider owner Greg Neville to be on a short list of Utah's best chefs, and his bustling east-side eatery combines friendly bistro/trattoria-style ambiance with the rich flavors and scents of Italy. Be sure to pick Neville's brain about Italian wines; he's an expert. The gorgeous décor and design of Mandarin would set it apart anywhere, but especially in Bountiful. Start with char shu, pot stickers and Singapore noodles before jumping into more exotic eats like Nanking chicken, lychee scallops, Szechwan catfish and eggplant with garlic sauce. 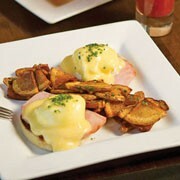 Situated in a cozy brownstone, Martine has long been a go-to destination on the downtown dining scene. This charming, independent restaurant quietly continues to entice customers old and new with its lovely ambiance, friendly and professional service and the outstanding cuisine of longtime chef Tom Grant. At Naked Fish, longtime chef Toshio Sekikawa teams up with younger sushi chefs to create vibrant dishes such as robotayaki lamb chops, octopus carpaccio drizzled with ponzu, Miyazaki Wagyu and much more, all in a vibrant, modern setting. Give yourself over to the talented sushi chefs and dine omakase style. The New Yorker has been one of Salt Lake City's most enduring fine-dining destinations since 1978. Chef Will Pliler has run the kitchen for much of that time, and his cuisine seems to continually improve. Dinner here is a no-brainer, but don't overlook the inexpensive lunch options, too. Owner/chef Scott Evans and his team are committed to incorporating sustainable, quality products from local farms and food artisans into every delicious dish. Be sure to phone ahead for reservations, as this cozy eatery is typically brimming with happy customers. 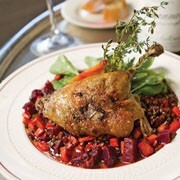 At Eric DeBonis' Paris Bistro, New American cooking is inspired by French, Italian and Mediterranean cuisines. So the Caprese salad butts up against salad Lyonnaise, and duck confit rests comfortably on the menu next to Margherita pizza, escargot and spaghetti carbonara. Spencer's serves only hand-cut, 21-day-aged USDA Prime grade steaks from Stockyards Beef in Chicago, all cooked to perfection. 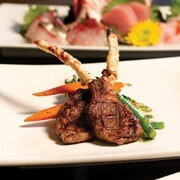 Excellent service, a top-notch wine list and classic steakhouse ambiance add up to delicious dining. Best restaurant in Salt Lake City? A lot of people think so. Takashi Gibo is a world-class chef who not only stuns customers with sensational sushi and cooked dishes, but also manages to be one of the kindest people you will ever encounter. For more years than I care to remember, Tiburon restaurant has been the go-to eatery for fine dining in the south end of the Salt Lake Valley. The char-grilled elk tenderloin with duxelle and green peppercorn demi-glace has been a crowd-pleaser pretty much since day one. And, the seared ahi tuna dusted with seven Asian spices and black sesame seeds is another can't-miss dish. Excellent service rounds out the exquisite Tiburon experience. The hottest spot in the South Valley, Vuz is an eye-popping restaurant that would seem to be more at home in Vegas than Draper. 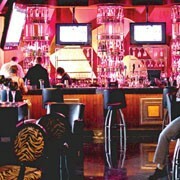 Belly up to the Vuda Bar before tucking into dinner in one of Vuz's stunning, sprawling dining areas. Chef Kaharim Becerra's cooking is strong enough to match the stunning ambiance. Whether you choose to linger at the bar with a custom cocktail or enjoy a delicious meal at a table, Wild Grape delivers excellent food, service and ambiance, not to mention a terrific wine list at prices that won't blow the budget. Tucked away in South Ogden, Zucca chef/owner Elio Scanu's culinary repertoire ranges from magnificent Margherita pizza to roasted organic chicken with foie gras emulsion. Don't let it out, but he's one of Utah's most gifted chefs, and Zucca is one of our most appealing eateries.